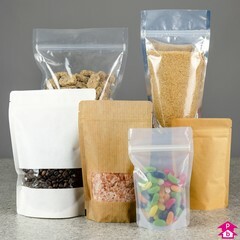 Polypropylene plastic bags with an integral 'peel and seal' adhesive strip to enable the bag to be easily and effectively sealed once your product has been added into the bag. 8 Products. 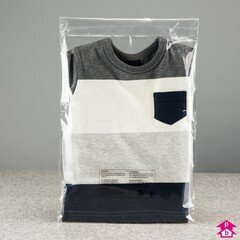 Premium quality 40mu thick polypropylene display bags with a peel-'n-seal lip for easy sealing and printed with a bag suffocation warning notice (PWN), suitable for displaying clothing and fabrics. 1 Product. 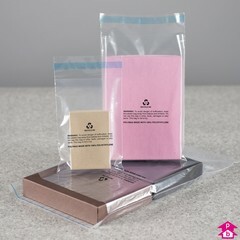 A limited range of thinner (30 micron thick) economy polythene display bags with a peel-'n-seal lip for sealing and a suffocation warning notice printed on (PWN). Suitable for displaying lightweight, budget clothing and fabrics. 13 Products. 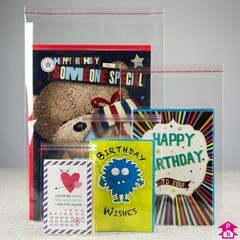 High clarity 40 micron thick polypropylene bags with a sealing strip already attached for convenience - suitable for card bags and for displaying photography and artwork. 8 Products. Safety bags with a peel 'n seal adhesive strip, with 6mm perforation air holes to reduce risk of suffocation and a printed warning notice (PWN). These bags are particularly suitable for Amazon merchants as they're designed to conform to the font-size and wording that Amazon stipulates for clear peel and seal polythene bags. This range also includes two biodegradable safety bag options.